The OASE Filtoclear 6000 is a UV pressure filter that is suitable for 500 litres - 2500 litres. This filter should be paired with a solids-handling pump that has a flow of about 5500 litres per hour. We recommend the Aquamax 5500 if you are not pumping the water up to a waterfall after the filter. Maybe consider a stronger pump like an Aquamax 8500 if you are pumping it up to a waterfall up to a metre high. 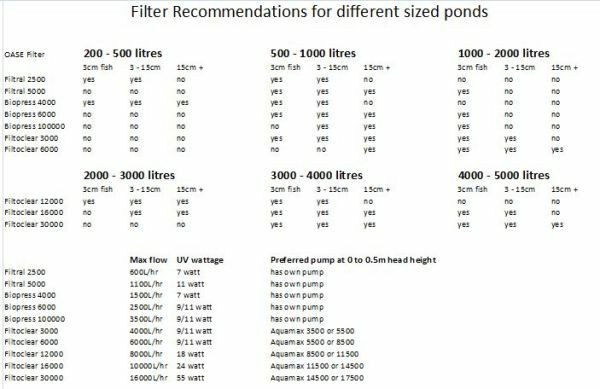 You're reviewing:OASE Filtoclear 6000 UVC Pond Filter + 2 FREE Spare 11w UV Globes worth $49.90!